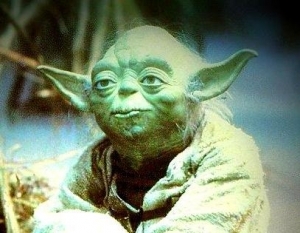 Yoda-Speak in Shakespeare Quiz :: Grammar, style, and proofreading quizzes use sentences from literature. Strong am I in the Force. Rude am I in speech . . .
Answer the following questions by unscrambling the word order in sentences from Shakespeare’s plays. a. She needs the divine more than she needs the physician. b. The physician needs her more than the divine needs her. c. She needs the physician more than the divine needs her. a. Happy mothers are younger than she is. b. Younger girls than she are happy mothers. c. Mothers are made happier when they are younger than she is. a. That place does not need me to lead it. b. I don’t need that place to lead me. c. I won’t need anyone to lead me from that place. a. Rosaline, the one you love, eats at the Capulet’s traditional feast. b. At the Capulet’s traditional feast you will eat with Rosaline who loves you. c. Rosaline will eat at the Capulet’s traditional feast you love. a. Don’t forget to speed up, Antonius, so you can touch Calpurnia. b. To touch Calpurnia, Antonius, don’t forget your speed. c. Antonius, don’t forget to slow down so you can touch Calpurnia. The Star Wars screenwriters use syntax inversion to characterize Yoda as an ancient Jedi Master. Inversion also makes Yoda’s lines stand out, reinforcing his superior wisdom and status.